Although commercial egg layers hardly go broody, it happens sometimes. When a hen is broody, it stops laying eggs and try to hatch some eggs. Sometimes a broody hen will sit on no eggs at all. If you don’t want to hatch any eggs, it is important that you break a broody hen whenever you find one. This applies especially if you raise them for profit or family eggs. 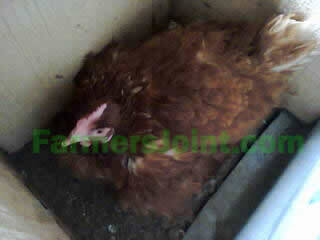 This is because a broody hen will eventually loose weight and stop laying eggs. Another disadvantage is fighting in the next box. A broody hen will try to defend her spot in the nest and this can cause fights that will lead to broken eggs and subsequently egg eating.